As an aging city with a very limited stock of age-friendly housing, Portland’s Age-Friendly Advisory Council recognized the need for policies to better support the development of age-friendly housing. Our age-friendly practice consists of the development of an equitable housing goal and 10 age-friendly housing-related policies, as articulated in Portland’s 2035 Comprehensive Plan, which took effect on May 24, 2018. Specifically, Goal 5.b. of the Comprehensive Plan states, “Portland ensures equitable access to housing, making a special effort to remove disparities in housing access for people with disabilities, people of color, low‐income households, diverse household types, and older adults.” Among the 10 age-friendly housing-related policies in the Comprehensive Plan, two pertain to Urban Form (3.4: All Ages and Abilities; 3.19: Accessibility), two to Design and Development (4.5: Pedestrian-oriented Design; 4.12: Residential Area Continuity and Adaptability), five specifically to Housing (5.7: Adaptable Housing; 5.8: Physically-accessible Housing; 5.9: Accessible Design for All; 5.19: Aging in Place; 5.53: Responding to Social Isolation) and one to Transportation (9.9: Accessible and Age‐friendly Transportation System) (see next section for policy details). To develop the policies, Portland State University, as the convener of the Age-Friendly Portland Advisory Council and its Housing Committee, of which older people are members, led the provision of written and verbal testimony to the City’s Bureau of Planning and Sustainability and the Planning and Sustainability Commission. Support was garnered by highlighting the housing actions in the Action Plan for an Age-Friendly Portland, which was approved by City Council in 2013 (e.g., Housing Action Item 1.2 – Improve Accessible Housing; Action Item 1.4 Advance Opportunities for Aging in Place) as well as actions outlined in the Portland Plan (a 20-year strategic roadmap) organized around an equity framework which emphasized expanding accessible and age-friendly housing and enhancing community livability. The Action Plan for an Age-Friendly Portland was developed following a baseline assessment of the city’s age friendliness, conducted as a part of the WHO’s Global Age-Friendly Cities project. From 2014 to 2016, Council and Committee members participated in the review of draft policies and offered alternative language that was age and ability friendly. Phrases such as “people of all ages and abilities” and “across the life course” were suggested for inclusion in housing and design-related policies, and verbal testimony by older adults, people with disabilities, academics, and other professionals persuaded the City to add the 10 policies mentioned above. Policy work is time-consuming and requires extensive outreach efforts in order to encourage civic engagement, including through public testimony concerning policy proposals. Both specialized knowledge and public persuasion are required, Our efforts relied on applying the expertise of members of the Advisory Council and its committees, including academicians, planners, and aging services experts, and written and verbal testimony from older adults, people with disabilities, and others concerning their lived experience. The equitable housing goal and housing-related policies developed will afford current and future generations the ability to age in place, within a supportive and vibrant community. Other target group(s): People of mobility impairments, families, cyclists, and all others who would benefit from universal design and accessible environments. Other sector(s): Policies included in the 2035 Comprehensive Plan covered the following areas: Urban form, design and development, housing, and transportation. Other Issues: Design and development; urban and regional planning; policy. How collaboration worked: Portland State University researchers have been able to advance age-friendly policy by defining a problem (e.g., the aging of the city, results from the baseline assessment of the city’s age friendliness); forming policy proposals (e.g., through collaboration with the Bureau of Planning and Sustainability); and garnering political support (e.g., acceptance by City Council of the Action Plan for an Age-Friendly Portland). The policy-related efforts have required expertise and advocacy from members of the Advisory Council and the community. When university faculty are involved, their advocacy comes in the form of expert testimony, citing extant research and evidence in order to inform the policy decisions of government leaders and staff. Details on older people's involvement: Older adults are members of Portland’s Age-friendly Advisory Council and Committees. Additionally, older adults are involved in age-friendly advocacy in many ways, including being connected through organizations represented on the Advisory Council, such as AARP Oregon and Elders in Action. Yes, we have received feedback on age-friendly housing policy, both positive and negative. On the positive side, older adults have expressed pleasure in seeing Portland commit to complete and livable communities that may afford them the opportunity to age in their homes and communities. Additionally, they have been pleased with opportunities for engagement and co-creating a Portland that will work for them in the future. However, there has also been negative feedback. In particular, some of the policies have promoted changing environments, including increased density in existing neighborhoods. The idea of change, especially change to one’s community, has caused some discomfort for older adults. This is a valid concern and needs to be weighed carefully when proposing policies that are not easily reversed. This feedback also underscores the importance of approaching age-friendly work in an inclusive manner. Yes, we plan to expand the age-friendly housing policy efforts and are actively engaged in two new efforts aimed at developing local zoning codes – the Residential Infill (single-family code update) and Better Housing by Design (multi-family code update) projects – which go before City Council in fall, 2018. 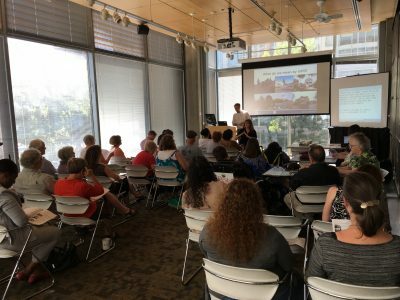 Additionally, we continue to look at ways to become involved in subsequent efforts at the county and regional levels, community-level projects focused on specific areas of Portland, as well as urban centers and transit corridors, and additional policies such as incentives for the development of accessible and affordable accessory dwelling units (also known as “granny flats”). Policy work is difficult, as it is time-consuming and requires tremendous outreach in order to encourage civic engagement. However, voices of support or opposition to proposed policies are critically important, as Portland operates through an unofficial “squeaky wheel” system (i.e., squeaky wheels get the grease). In hindsight, we should have enlisted legislative advocates/lobbyists to train older adults in developing and delivering testimony. In the future, our age-friendly partner organizations will facilitate such preparation. One of the difficulties in developing age-friendly housing is the complexity of the issues involved, as these cross cut transportation, urban design, and service provision. Within the City of Portland’s Bureau of Planning and Sustainability there are self-professed “code heads,” and many community members also have expertise in areas such as design and development. Considerable expertise and learning are needed to prepare expert testimony and/or advocate for policies. We have addressed these challenges by developing summary points for verbal and written testimony and participating in local happy hours with community members to answer questions and give advice for testimony. Additionally, we have made the case that existing housing is “Peter Pan” housing that assumes that housing is designed for people who are never going to age nor grow old (credit for term: Dr. John Pynoos). Another challenging aspect of encouraging the development of age-friendly housing is the resistance that has emerged from market-rate and affordable housing developers. On the affordable housing side, this has come as a surprise; however, the push back is understandable as these developers’ “margins” for development are “thin,” and accessibility regulations are seen as another requirement that could kill a critically needed project before it gets started. From the market-rate developers we are hearing that Portland has a lot of raised and sloped lots – which is true – and that visitability provisions would be a “poison pill” to developers. In order to address these challenges, we have presented data pertaining to the unprecedented number of older adults expected in Portland and the region, as well detailing the dearth of accessible housing that is available. We have also tried to explain to developers that there is a market opportunity and that early innovators may become market leaders. Another challenging aspect of encouraging the development of age-friendly housing is the resistance that has emerged from market-rate and affordable housing developers. On the affordable housing side, this has come as a surprise; however, the push back is understandable as these developers’ “margins” for development are “thin,” and accessibility regulations are looked at as another requirement that could kill a critically needed project before it gets started. From the market-rate developers we are hearing that Portland has a lot of raised and sloped lots – which is true – and that visitability provisions would be a “poison pill” to developers. In order to address these challenges, we have presented data pertaining to the unprecedented number of older adults expected in Portland and the region, as well detailing the dearth of accessible housing that is available. We have also tried to explain to developers that there is a market opportunity and that early innovators may be able to be market leaders.